Simon Williams | "How Would You Fix...?" …the Origin of the Vision, This Time For Sure! 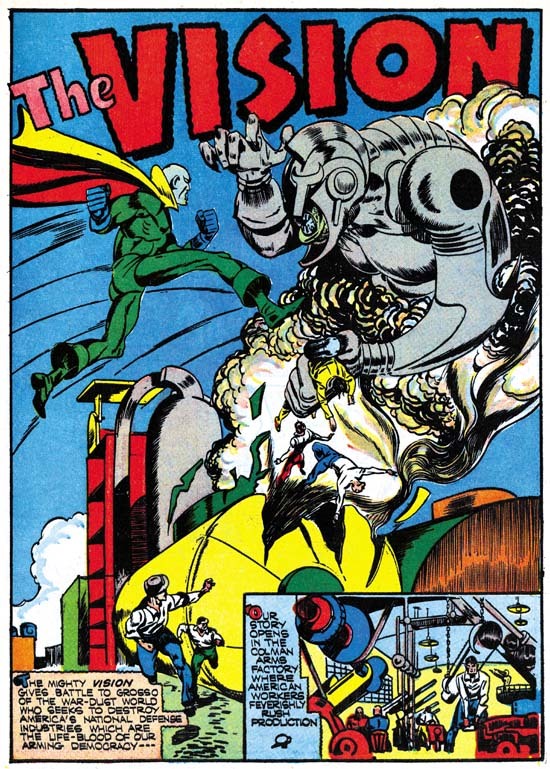 Figure 1: The Golden Age Vision, Aarkus, from Marvel Mystery Comics #24, page 1 (and is that Ultron? Oops, it’s Grosso from the “Dimension of War-Dust”). From the very first appearance of the Vision there have been some vexing questions never properly addressed in all the subsequent revelations and retcons of the character’s origin. Why did Ultron come up with such an overly complex and not entirely logical scheme of sending a menacing android to first threaten then sort of but not quite infiltrate the Avengers in a way that would fall apart and be exposed almost immediately? If the Vision was only intended to lure the Avengers into a trap, why would that require an android with sufficient powers and will to rebel against Ultron and defeat his creator? Why did Ultron just happen to give that android the name and approximate likeness of the original Vision of the 1940s, a being named Aarkus from another dimension who had been absent from Earth for some twenty-five years? 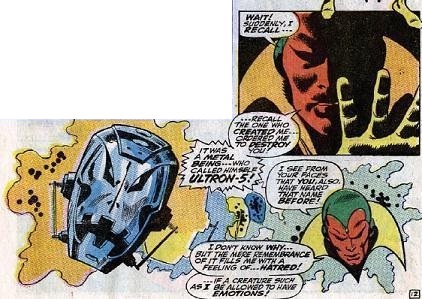 In fact, Ultron was unknowingly influenced to do these things by Aarkus himself. Aarkus wanted the Vision in the Avengers, and used Ultron as the vehicle to make this happen. Why? Because Aarkus needed to establish a surrogate acting on his behalf within the Avengers, and do so in such a way that this surrogate could never be traced back to him. Despite the name and appearance, the true connection between Aarkus and his surrogate had to be so obscure that it couldn’t be uncovered even by someone with the ability to monitor all time and space, even if that someone was carefully studying the entire history of the Avengers. Even this agent couldn’t know his true nature – because Aarkus is working against an opponent with telepathic spies placed all throughout human history. And if you’re trying to elude telepathic detection, one strategy would be to use artificial intelligences as your agents: beings whose thoughts can’t be intercepted by telepaths capable of reading organic minds. Nor can your instructions be delivered in the form of programming that might be deciphered if the enemy captures one of your operatives and dumps its memory. Scheming against a nearly omniscient foe requires you to be very circumspect. Even after renovating itself several times, Ultron isn’t up to building the android Aarkus requires, but Aarkus quietly makes arrangements for Ultron to acquire one second-hand. Traveling back to 1924 (yes, Aarkus is a time traveler) Aarkus arranges a sequence of events indirectly leading to a copy of the English translation of Karel Čapek’s play “Rossum’s Universal Robots” being delivered to a public library. The book is left out on a table where it catches the eye of one Phineas Horton. Reading the play inspires Horton’s imagination and leads to a new direction for his studies he would not otherwise have chosen. Fifteen years later – following a period spent in the strange town of Timely, Illinois, as a protege of its unusual mayor – Horton develops the world’s first self-sustaining artificial humanoid. The Horton android is decades ahead of its time, but its wholly self-contained internal power supply is deficient in some crucial ways. A subsystem meant to allow the android to phase in and out of our dimension – a design Aarkus slipped into the computer database used by “Victor Timely” during his tutelage of Horton – is woefully underpowered. Instead of transferring mass across dimensions, it merely superheats the air around the android, causing the air to combust while rendering the android only slightly immaterial. The humanoid learns to control this effect, enabling him to burst into flame at will and then fly with his greatly reduced mass carried aloft by air currents. Thus is born the Human Torch…his entire career and his role in the Second World War merely a side-effect of Aarkus’ long game. The Human Torch’s synthetic mind is too sophisticated to be directly influenced by Aarkus the way Ultron was, but that’s not what he was made for anyway. Still, that underpowered subsystem needs to be fixed before the humanoid can serve his intended purpose. 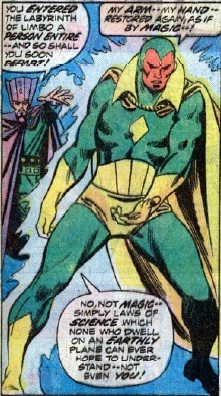 Aarkus takes a gamble and steps into Earth history personally, assuming the role of a costumed defender called “the Vision” during the early 1940s. Building a reputation as a hero over a span of the next three years, Aarkus is finally able to meet the Human Torch in person without being seen to make any special effort to do so. During their meeting, Aarkus is able to secretly tamper with the Torch’s power supply. The effects don’t show up immediately, but years later the humanoid’s systems fail, ultimately driving him to sacrifice himself in the Mojave Desert rather than endanger others. By that time, Aarkus has long since returned to the safety of his “shadowy realm” to manipulate events more indirectly. Another pawn of Aarkus would be the tragic Quasimodo. Through manipulation of Quasimodo, Aarkus is able to lead the Mad Thinker to the inactive Human Torch and further advance the sequence of events that ultimately bring that used android to Ultron. Ultron in turn recruits an aged and despondent Phineas Horton to revamp his first humanoid, making alterations Ultron doesn’t realise have been “suggested” by Aarkus. For one thing, the android’s previous memories are mostly erased and he’s given a new pattern for consciousness based on the recorded engrams of the deceased Simon Williams. Figure 2: Vision probing his memory and remembering waking up for the first time from Avengers #58, page 9. The most significant alteration made to the former Torch is that too-weak internal power supply being augmented by an external photonic collector on his brow. This added unit supplies the extra energy needed to get the dimensional phasing effect working at last. No more spontaneous combustion! Now the android can phase some of his mass out of our dimension and become intangible, or draw on mass the same way to increase his density. The android doesn’t realise these are baby steps on the way towards learning how to teleport entirely out of our dimension at will. But with his nascent skills, the Vision goes on to join the Avengers and becomes one of their most pivotal members…just as Aarkus needs him to be. There are various other AIs who encounter the Vision and the Avengers over the years, among them Isaac of Titan, Jocasta, and Aaron Stack. Each of these is more limited and constrained in their potential than the Vision, but each still serves a purpose in Aarkus’ plan through his ability to subtly manipulate their thought processes. Without ever realising it, these characters guide the Vision in certain directions, giving him experiences Aarkus knows he’ll need in order to develop the personality and skill set Aarkus needs him to have. For instance, his experience with Isaac isn’t a happy one, but it leaves the Vision with the ability to contact other AIs via nonlocal communication, able to influence their behaviour totally undetected the same way Aarkus can. Funny, isn’t it, that Immortus’ synchro-staff never got around to mentioning any of this while taking the android Vision on a tour of his history? There’s a simple explanation for that as well: the information wasn’t available to the staff or its master. Immortus – with access to all space and time – doesn’t know the real secret of the Vision’s origin. That’s because Immortus is the enemy Aarkus is trying to elude. Aarkus needs the Avengers to help him defeat Immortus, and at a critical moment he’ll need the Vision right there at the center of the team as a trusted friend, able to tell them what to do and have those instructions followed. Figure 3: Vision and Immortus from Giant-Size Avengers #3, page 37 (no ‘arm done Vizh;). Aarkus has tried to remove himself from the picture as much as possible, staging a puppet show that will be watched by someone with the capacity to observe all space and time in countless parallel universes. The contradictory origin stories Aarkus told during the Golden Age were intended to cloud the issue. In fact, if Aarkus were to ultimately win his gambit against Immortus, it would have to happen in such a way that history never records it on any of the timelines Immortus can survey. Aarkus has to wage war so quietly his enemy never even knows hostilities were/are/will be declared. So what is Aarkus really after? Where is he that Immortus could be unaware of him? Logically, he has to be in the one place Immortus can’t observe: right under his nose in Limbo itself. He’s within the citadel of Immortus, using Immortus’ own systems to remain undetected. To Aarkus, Immortus is an usurper in a realm where he doesn’t belong, a conqueror who took over Limbo and used it as a stronghold from which to manipulate history for selfish and destructive ends. The ultimate goal of Aarkus isn’t simply to kill or defeat Immortus, but to alter the events which brought him into existence so Limbo is free of him. Then Aarkus will be able to claim control of Limbo as its guardian, allowing no one to dominate it and keeping it from being used as the staging ground for any other time conquerors. Immortus, Kang, Doom, the Time Keepers, multiple others cannot be allowed to claim Limbo. To counter Immortus, Aarkus needs the Avengers – the ones who’ve consistently managed to keep the master of time and space at bay across all his incarnations. And when this silent war against Immortus needs a nudge in the right direction, the Vision will find himself drawn into Limbo, meeting Aarkus face to face for the one and only time in Immortus’ citadel. Here the two will have a “Luke, I am your grandfather” encounter in which Aarkus lays out his role in the Vision’s creation and persuades him of the importance of persuading the Avengers to do what Aarkus needs them to do. The Vision has to be persuaded that Aarkus is absolutely on the side of good and not simply looking to take the role of Immortus for himself. Fortunately for Aarkus, he knows exactly how to convince the Vision. Aarkus knows the Vision better than anyone. Aarkus knows that well into the Vision’s own future – after his appearance and behaviour have altered several more times, decades or centuries after all his fellow Avengers are all long gone – the Vision will return to Limbo hoping to find Aarkus again. Instead the Vision will find Limbo empty and unguarded. Suspecting someone has eliminated Aarkus and seeing the unsecured state of Limbo as a threat, the Vision will set about refortifying Limbo to continue the plan set forth by Aarkus all those years before. From his history as an Avenger, the Vision will figure out how to locate and organise the anonymous shapeshifting beings called Space Phantoms and use them as builders to reconstruct the citadel of Limbo under his guidance. And as anticipated, an outsider will arrive to claim Limbo as a base of operations. The Vision will be shocked to see Immortus, the foe he believed had been eliminated from history. The Vision will send the Space Phantoms to defend Limbo…but he’s made a terrible mistake. Having freed himself from enslavement and become his own individual, the Vision truly believed he could teach the passive Space Phantoms to do the same. They respond exactly the way he wants them to respond, but he’s underestimated how malleable and tractable they really are. When faced with the domineering will of their foe, the Vision’s forces defect to serving Immortus instead – their loyalties shifting so completely they forget the Vision was ever there. As a result, Immortus never learns of the Vision and never realises he’s being observed. Right under the nose of Immortus, within the citadel Immortus has claimed as his own, using the tools of Immortus to conceal his presence from his foe, the Vision will finally realise…well, you see what’s coming next. Aarkus and the android Vision were the same being all along. The Vision is his own grandpa. The snake that swallows its own tail, the self-creating scarab of Egyptian myth. The hero of the 1940s was secretly an android, amused to be called “the Vision” in his heroic exploits of that era as a remembrance of his wonderful but bittersweet earlier life decades later, even as he takes the steps to set that future life into motion exactly as he remembered it. And the cycle needs to be completed so that Immortus can be removed from existence and Limbo freed from control. But to do that, he’ll need the help of his long-gone fellow Avengers. Figure 4: Vision menacing Janet Van Dyne and she delivers the line that names him from Avengers #57, page 3.